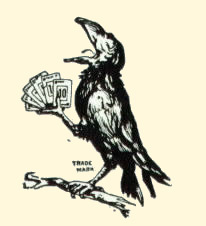 Hello, my name is Coit, and I have been collecting Rook Cards for years now. This WEB site is not a business but a place to display my private collection as well as promote communication between Rook Card collectors. Check out my Rook Card Museum. Keep in mind, just because a certain item is contained in the set, does not mean it was produced that way. Example: an instruction book from an earlier set may end up carried over to a newer set by the previous owner. It is hoped that after looking at many sets, one may be able to make some conclusions as to what is original to that set and what is not. The dates shown in the museum are the earliest and the latest dates printed on the item - not necessarily the date of production. Each thumbnail image may be enlarged by mouse clicking on the image. The cards in the Museum (My Collection) may be searched by box top order or card back order as well. Other miscellaneous items pertaining to the game or history of Rook may also be found on the site. Things such as how Rook was birthed, US Patent records, and other interesting artifacts may be found there. This collection is in continual growth mode - but adding items to this site comes in spurts - as time permits. There is a Variations section, where I am trying to organize differences in: Box Design, Card Back Design, Card Face Design and Rook Card Design - a catalog of all the different variations in each group. A (growing) collectors checklist, so to speak. These may have sets listed that are not in my collection - to make the catalog more useful to collectors. Sets not in my collection will not have the "RookCards.com" watermark on the bottom of the image. If you have a set that is not listed, I would be pleased to list it if you send me a scan. One of the projects I would like to accomplish in the future is to convert the many different Rook instruction books I have into an Adobe format.